Beetroot also known as beet is a good vegetable and contains good source of several nutrients. Potassium, minerals, folate, iron, vitamin A and vitamin C are few major ingredients of beetroot. Including fibrous beetroot in diet helps in many ways – regularity in digestion, reduces inflammation, improves athletic performance, reduces progression of dementia in elders and good for heart health and blood pressure conditions. Sugar content in beetroot is high. People with diabetic condition should limit consumption of beetroot. Dishes made of beetroot are tasty. Beetroot curry, sambaar, salad, chutney, cutlets, falafel, halwa, puri, paratha, rasam, raita… are few examples in the long list of beetroot recipes. 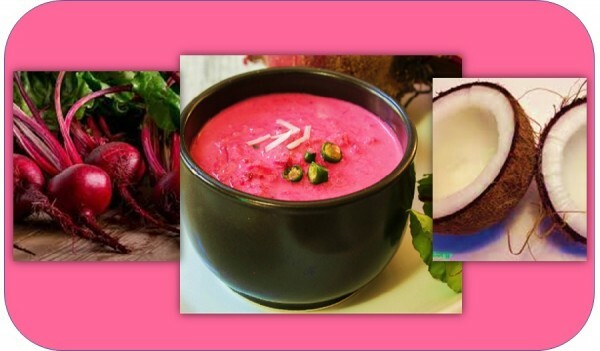 Beetroot coconut soup is a delicious and tasty soup for all seasons that one should try. After 3-4 minutes, add one cup water and bring the contents to boil. Turn off the heat and allow content to cool. Garnish with chopped cilantro and serve hot beetroot soup for lunch or dinner.